In Andrea Arnold’s masterful American Honey, two newcomers make a big impression. The first is 21-year-old Sasha Lane, famously discovered by Arnold on a beach on Miami during spring break. The second is the long string of braided hair that dangles from the nape of Shia LaBeouf’s neck. 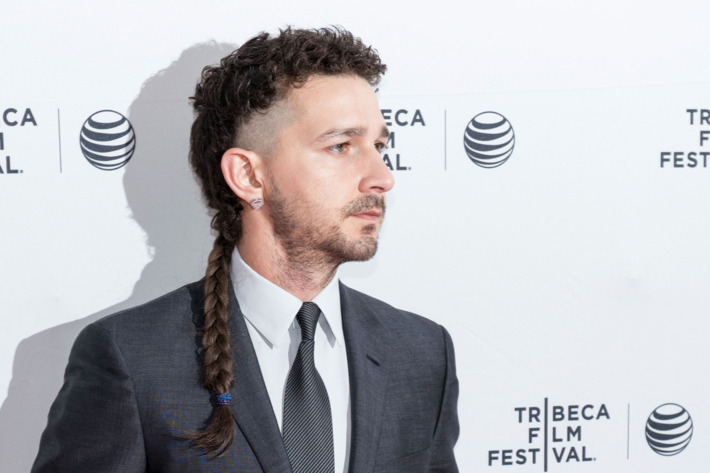 Yes, that’s right — in what might be the best work of his career, Shia LaBeouf sports a glorious rattail. Those facts are not unconnected. Though American Honey is the rattail’s film debut, it’s been in the public eye for quite some time. (In this way, it resembles the Vine stars and Bachelorette contestants who take up so much tabloid space these days — for all of them the rule is “Get famous first, do the work later.”) The tail first burst into the spotlight last year, when paparazzi caught it hanging out with the actor and his girlfriend, Mia Goth. When it later accompanied LaBeouf on the red carpet of the Tribeca Film Festival, a star was born. The Daily Mail gave the rattail a level of attention usually reserved for Kardashian areolae. Lifestyle bloggers created guides to stealing its look. GQ snagged an exclusive interview. But could it act? Bigger stars than the rattail had seen their moment fizzle out — remember Gretchen Mol? But worry not. I can gladly inform you that American Honey sees the rattail give the performance of its life. The tail makes its first appearance in a supermarket, dangling insouciantly as LaBeouf’s Jake offers Lane’s Star the chance to “explore America” and “party” with his merry band of disaffected teens. Here the rattail symbolizes freedom, not only the freedom from drudgery and poverty, but also the freedom from conventional norms of taste. Just as Bernie Sanders’s wild hair and rumpled suits spoke to his supporters on a deep emotional level, so too does the rattail speak to Star: Society’s notions of propriety are dumb; why should we follow them? Observers have compared the rattail to Davy Crockett’s coonskin hat, and the analogy’s not far off base: The tail marks Jake as a self-reliant adventurer exploring the wild frontier of society. There’s no way you’d ever see that hairstyle on a guy with a commute and a 401(k). HR would never allow it. But the rattail is not a one-note actor. It has range. When Jake interrupts Star’s hangout sesh with a group of mezcal-sipping ranchers to rob them, the rattail is almost as intimidating as the gun in his hand. You’d better believe I’m serious, it says. Serious and crazy! When Jake and Star ride on top of the group’s van, the rattail flows gently in the breeze, like it’s listening to a Rihanna song. And when Jake gets sad, the rattail does too, drooping mournfully over his shoulder. In moments of vulnerability, I swear he even strokes it. Unfortunately, as happens far too often in Hollywood, the rattail was cut down in its prime. LaBeouf apparently got rid of it shortly after American Honey stopped filming, cutting it off in late summer 2015. (As always, the Daily Mail was on the case.) But there’s a poignant beauty to its passing — like James Dean or John Cazale, the hairstyle died without ever giving a bad performance. As the saying goes: Live fast, die young, leave a beautiful rattail.